The Ancient City of Nessebar at a peninsula in the Black Sea holds over 3,000 years of history, with Thracian origins and later becoming an important Greek colony and Byzantine settlement. The Greek colonists left an acropolis, a temple of Apollo and an agora. The most important monument from the Byzantine period is the Stara Mitropolia Basilica. In the Ancient City of Nessebar, several successive civilizations have left their mark over a period of 3000 years. It started with the local Thracians, followed by the Greeks, the Romans and their eastern successors the Byzantines who made it into a Christian spiritual center in the Middle Ages. Not much of substance has been written in reviews so far about this little Bulgarian town, which is threatened by its proximity to the resort of Sunny Beach (the name says it all…) and overrun by day trippers of the worst kind especially in summer. Nessebar’s attraction nowadays lies mostly with its Byzantine churches - there is virtually nothing left of the other periods of his existence. It reminded me a bit of Ohrid in Macedonia, a small town with Byzantine churches dotted here and there amidst souvenir shops and restaurants. 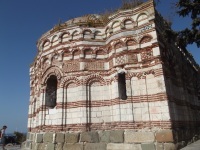 None of the old churches in Nessebar are in religious use anymore however (they are either ‘museums’ or ruins), while there is still some (albeit limited) religious feel to Ohrid. You can buy different combination tickets to visit the various museums and churches in the town. I took one of 18 Lev (9 EUR), with which you can enter the archaeological museum, the St. Stephen Church and 3 other churches of your own choice. I started my tour at the archaeological museum, which lies right after the city wall when you enter the peninsula. There was hardly anyone there. They display here mainly relics from the Greek and Roman periods of the city - Nessebar was a colony of both. It’s an interesting enough start, but I found no memorable objects amidst the collection. Walking further onto the peninsula, the first large church that you encounter is that of St. Stephen. This is the absolute highlight in terms of murals in Nessebar; the walls are completely covered with 258 different representations. There is almost no empty space left. After a French group with their guide left the church (it took some waiting before they finished occupying the space), I was also the only visitor here for a while and could admire the paintings one by one. 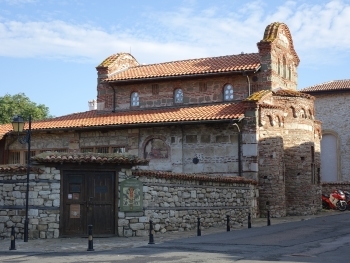 Most churches in Nessebar are not known for their interior wall paintings but for creative wall decorations on their exteriors: bricks have been arranged in patterns between the gray stone. Colourful pieces of ceramics are also added for additional decoration. The Church of Saint Paraskevi is the best example of this. On my last morning I walked a full lap of the peninsula along the waterfront. Even if you walk slowly, this takes less than an hour. On the south side lies another of the most beautiful churches - the Church of Saint John Aliturgetos. This was heavily damaged by an earthquake, but is now being restored with money from the US Ambassadors Fund. The brick patterns are especially beautiful here. I stayed in Nessebar for one night, which was just enough for me. Early in the morning is actually the only time of day that Nessebar is not flooded with tourists. I had a pleasant evening as well, sitting on my balcony at the Nessebar Royal Palace hotel with a view of the beautifully lit Church of Saint John the Baptist next door. Nessebar deserves its listing just on account of its location on a peninsular jutting out into the Black Sea. But by taking a short walk through the town I discovered streets of picturesque wooden houses, Byzantine ruins, and churches of many different hues, from the huge church of the Virgin Mary, the ruined church of St Sophia and the many small Orthodox churches which appear everywhere. I reached the town by taking bus no.11 from Burgas station. Holland America included Nessebar a few years back. We spent a half day taking in the old town. Unfortunately HAL's time table had us there before any shops opened; before any locals showed up for work. We met a few, and were delighted they could grasp some of our English. As true Americans, we grasped nothing of their Bulgarian! Rich in old word history, the town demands the visitor do some homework before walking the town. The guides are limited in English - after all, Bulgaria is still getting started in the tourist business. Would I visit again? Indeed, and this time I'd opt for an over-night. The Bulgarian kitchens were just getting warmed up when we headed back to the ship. Next time, I want lunch!! And, the people are all smiles. I've been to Nessebar twice. First time was in 2002, second time was August 2004. I brought my daughter along and she was really impressed by not only Nessebar but Bulgaria overall. My wife comes from Plovdiv, Bulgaria.We meet in Germany. My other intrest of Bulgaria, especially Plovdiv, is its place in our Christian History. I agree with the afore mentioned comments of Nessebar, and Bulgaria. I would love to live and work on the Black Sea Coast. Between,Nessebar and Primisko. Nessebar may seem to be not very special, but if you care to find out its history - ouch, this place is quite interesting! Then you start to appreciate its numerous small Byzantine churches, ancient monuments (there is good museum), picturesque streets with specific houses. I spent there one day - this was the best experience for me in Bulgaria. 135 Community Members have visited.